Data Reviewer for Electric Utilities provides more than 40 out-of-the-box checks that users can run individually, group into batch jobs (as .rbj files), or run as a scheduled service. Redlands, California—Esri this month announced the release of its Data Reviewer for Electric Utilities solution. 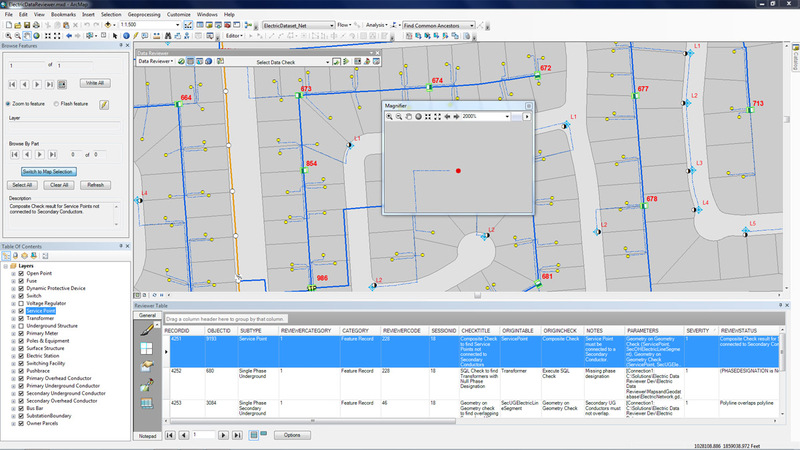 It provides the preconfigured ArcGIS Data Reviewer for Desktop to be used to validate, maintain, and improve the integrity of electric distribution data. Data Reviewer for Electric Utilities provides a set of tools to simplify many aspects of automated and visual data quality control. The solution provides more than 40 out-of-the-box checks that users can run individually, group into batch jobs (as .rbj files), or run as a scheduled service. "As utilities continue to collect more information about their electric network, it's imperative that this information be validated to ensure accuracy and completeness of the overall content," Esri solutions team lead Patrick Dolan said. "The release of Data Reviewer for Electric Utilities allows utilities to automate the way they validate and measure the overall health of their electric distribution network, providing them with greater insurance that the electric network is accurate and complete." Download the Data Reviewer for Electric Utilities solution for free, including a demonstration and sample electric dataset. Learn more about Esri solutions for utilities at esri.com/electric.